All of the merchandise is professionally designed and manufactured to the highest standards. The operating scope of EB FightGear includes the design, manufacture, marketing and distribution of all the conglomerate’s merchandise. 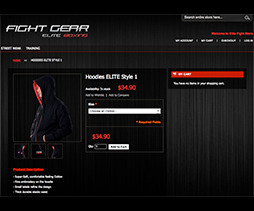 The first product line trades under the name Elite FightWear. This is a range of trendy, street clothing and accessories targeting a young and fashion-conscious demographic of both male and female customers. The range features t-shirts, sweat shirts, sweat pants, sweat suits, hooded tops, jackets, shorts, sneakers, bags and sweatbands.